Why do we need Sea Farming? The UN estimates that the global population will grow to approximately 9.7 billion by 2050. Although 70% of the Earth’s surface is covered by the ocean, only 6% of the protein sources for human consumption is produced in the sea. Based on this information, it is obvious that demand for protein will continue to increase, but the resources for land based protein production will be scarce. That means the key to increased protein production must be in the ocean. Most animal protein in our diets comes from pork, poultry, and beef, with salmon production representing a small portion of global protein supply. 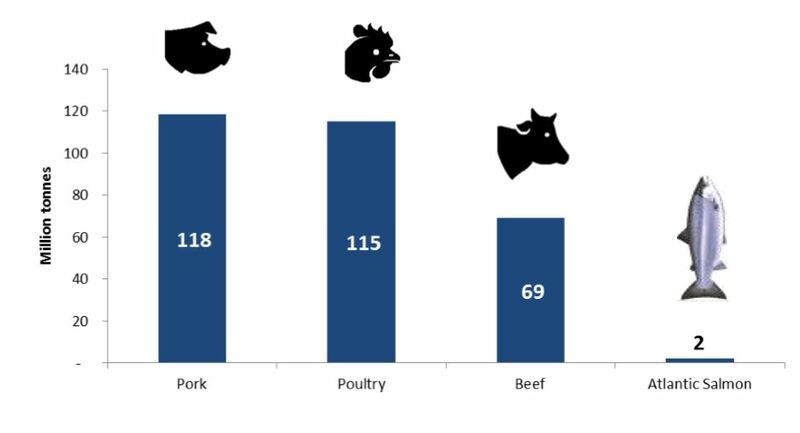 In 2016, FAO estimated a production of 118 million tonnes Carcass Weight Equivalent (CWE) of pork, 115 million tonnes Ready to Cook Equivalent (RTC) of poultry, and 69 million tonnes CWE of beef and veal. In contrast, the total production of farmed Atlantic salmon was around 2 million tonnes (GWE). If we combine both the farmed and wild catch of all salmonids it amounts to 3.6 million tonnes (GWE) in 2016. Energy retention is measured by dividing energy in edible parts by gross energy fed. Both cattle and Atlantic salmon has a high energy retention compared to pork and chicken. In addition to its resource efficient production, farmed fish is also a climate friendly protein source. It is expected to become an important solution to providing the world with vitally important proteins while limiting the negative effect on the environment. There is for example less environmental impact in salmon production compared to other protein producers. 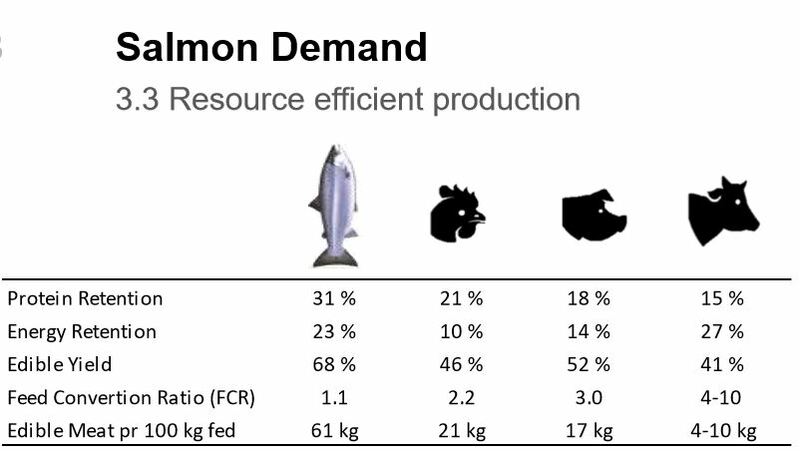 When comparing the environmental impact of farmed salmon to traditional meat production, the carbon footprint for the farmed salmon is 2.9 carbon equivalents per kilogram of edible product whilst corresponding figures are 2.7kg and 5.9kg of edible product for chicken and pork, respectively. Cattle’s carbon footprint is as much as 30 carbon equivalents per kilogram of edible product. Freshwater is a renewable but limited natural resource, and human activities can cause serious damage to the surrounding environment. In Norway, farmed Atlantic salmon requires 2,000 litres per kg of fresh water in production which is significantly less than other proteins.